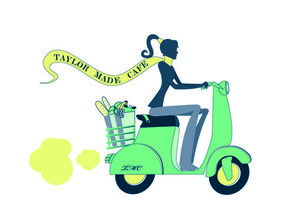 Taylor Made Cafe creates a fresh Vegan Special daily, please call for details. All tortillas and dressings are vegan friendly. Whole wheat or spinach wraps available. Turkey, spinach, yellow peppers, strawberries, feta, walnuts and raisins with honey mustard dressing. Chicken, spinach, pine nuts, black olives, red onions, tomatoes and goat cheese with balsamic vinaigrette. Turkey, romaine lettuce, tomatoes, mushrooms, carrots, peppers and chick peas with TMC homemade healthy dressing. Chicken, mixed greens, beets, blueberries, shaved gouda cheese and pecans with sun-dried tomato dressing. Turkey, romaine lettuce, artichoke, kidney beans, red onions, swiss cheese and almonds with italian viniagrette. Chicken, romaine lettuce, shaved parmesan, cheese, tomatoes and mushroom with lite Caesar dressing. Chicken, mixed greens, string beans, mandarin oranges, crunch sesame seed sticks, peanuts and asian viniagrette. Chicken, romaine lettuce, carrots, broccoli artichoke, tomato and onion with a roasted red pepper dressing. Chicken, sweet yellow curry, yogurt, raisins, almonds and mandarin oranges. Chicken, yogurt, dried cranberries, celery, walnuts, cinnamon and apples. Tuna, homemade lemon red wine vinaigrette and celery with a dash of salt and pepper. Accompanied with lettuce, tomato and lemon garlic vinaigrette. Tuna, sweet relish, diced red onions, carrots, celery and peppers with a dash of pepper. Accompanied with lettuce, tomato and lemon garlic vinaigrette. Sautéed white meat chicken with mushroom, onion and Swiss cheese melted in a whole wheat or spinach tortilla. Spicy or not spicy? All natural white meat turkey burger on whole grain bread w/ choice of fixings. Black beans, red beans, rice, cheese, tomato, onion and shredded lettuce in a whole wheat or spinach tortilla. Pressed on the grill with ham, cheese, wilted spinach, tomato and honey mustard.